Coming off a fresh redesign in 2015, the Ford F-150 and its new aluminum body have been exceptionally well received by consumers. The half-ton pickup is doing so well that the Ford Motor Company has had trouble meeting the demand! To keep the pick-up fresh for 2016, Ford made a few simple changes to extend the F-150’s huge competitive advantage in the highly contested half-ton truck segment. Ford made no changes to the structure, design, or performance of the 2016 F-150, but that doesn’t mean that they didn’t shake up the game this year. While the structure of the car remained similar, a few modifications distinguish the 2016 model from the 2015. These include new exterior colors, new special appearance packages, and a heap of new safety features. The F-150 even got a handful of technological upgrades for the new year. Finally, for the first time ever, Ford released a new premium trim line geared toward those looking for a more luxurious experience. Let’s first talk about the most noticeable difference between this year and last. The F-150 is available in any of Ford’s 13 colo r options, including the all-new Shadow Black and Lithium Gray, which replace the previous Tuxedo Black and Guard Metallic options. These new colors complement the newest Special Edition Appearance Packages available for the 2016 F-150 XLT and 2016 Lariat. Both packages add unique 20-inch wheels, tinted headlights, unique side stripes, a darker grille, and black painted running boards. Also included are the new Alcantara seats that boast red bolster and red accent stitching throughout the cabin. As soon as you open the doors to the pickup, you’ll immediately notice the brand new Sync 3 infotainment center that replaced the previous year’s MyTouch Ford system. Updated for 2016, the new Sync 3 is more user friendly, quicker, andsignificantly more advanced. The Sync 3 with AppLink technology allows the F-150 to stay connected to social media on a whole new level and provides considerably more control over applications a new high-resolution display. The remainder of the interior has undergone few updates, aside from the new Pro Trailer Backup Assist switch located just below the Sync 3 screen. This is the first pickup truck with this technology, making it significantly easier for drivers to reverse with a trailer attached. Drivers simply need to turn the knob in the direction they would like the trailer to go as they reverse, and from there the truck will make automatic steering changes, as well as limit the speed on treacherous terrain. 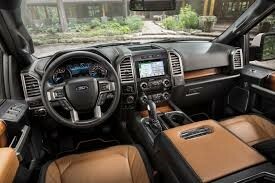 While designing this technology, Ford earned five patents and have another 10 pending. It’s safe to say you won’t see a feature like this from the competition anytime soon. New for 2016 is the first of its kind, top-of-the-line Ford F-150 Limited—the most advanced and luxurious F-150 ever released. Designed to meet the needs of the most discerning truck customers, the F-150 Limited is perfect for those interested in exclusivity, capability, and craftsmanship. The current generation of F-150 is already the safest, smartest, toughest, and most capable truck that Ford has released, but the Limited trim sets a new bar for what customers should begin to expect from a high-end truck. Loaded with segment-exclusive technology, the F-150 Limited easily surpasses the accouterments of the well-appointed Lariat, King Ranch, and Platinum models. This decked-out truck even surpasses other Limited offerings from competitors, as the F-150 comes with more standard features than either the 2016 Chevrolet Silverado 1500 or the 2016 Ram 1500. 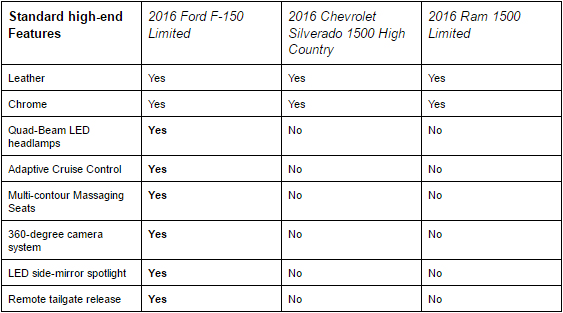 The table below shows just some of the ways the new F-150 compares to the competition. The 2016 F-150 Limited is powered by the 3.5-liter EcoBoost V6, allowing for towing up to 10,100 pounds when properly equipped. This powertrain produces 365 horsepower at 420 lb.-ft of torque, unsurpassed by any truck in its class with a comparable engine. 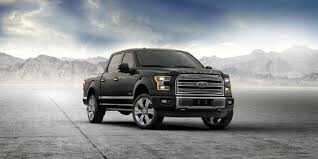 The F-150 has an EPA-estimated fuel economy of 13.84 L/100 km city, 9.8 L/100 km highway, and 11.76 L/100 km combined. The 2016 F-150 Limited is available in four colors—Shadow Black, Magnetic, Blue Jeans, and White Platnium. The 2016 F-150 has been name d the Insurance Institute for Highway Safety (IIHS) top safety pick of the year for the second year running. 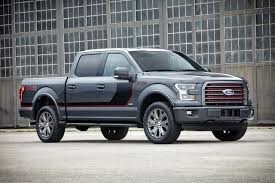 This year, instead of the SuperCrew trim being tested, the F-150’s two-wheel-drive version of the SuperCab was tested. This marks the first year that the IIHS has tested both extended cab and crew cab models of each. The F-150 was the only pickup to receive the highest score of “Good” across all categories. Most competitors, including the Ram 1500, Silverado, Toyota Tundra, and even the GMC Sierra, all managed to scrape by with an “Acceptable” grade. Much of Ford’s achievement is a direct result of the high-strength steel in the frame and high-strength, military-grade aluminum in the body. 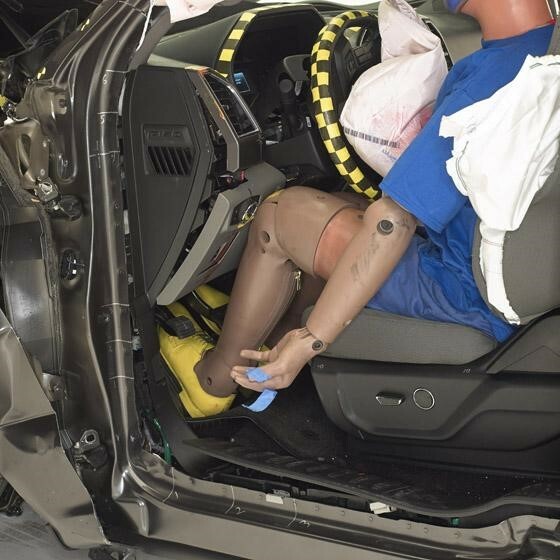 Ford developed 31 safety innovations for 2016. These include completely new cab structures reinforced with extra beams in the front and behind the front wheel wells, unique extruded aluminum roof cross-members, lightweight nylon hinge reinforcements, additional rocker panel stiffening, and specially designed wheel blockers to move impact forces around the passenger cabin. These exist on F-150 regular, extended, and crew cab models. As a result of these combined changes, the F-150 is also the only full-size, light-duty truck to earn the National Highway Traffic Safety Administration’s highest rating. 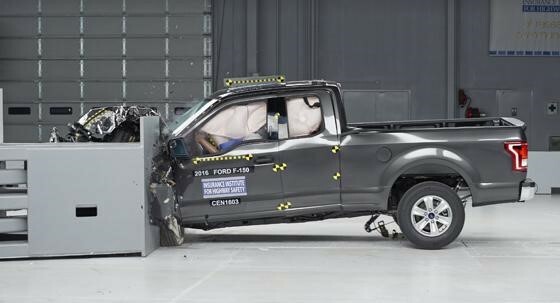 The F-150 received a five-star Overall Vehicle Score and a five-star rating for driver and passenger in all crash test modes and cab configurations (SuperCrew, SuperCab, and Regular Cab). This year’s F-150 is the toughest yet. Light but powerful, the F-150 comes with best-in-segment technology, great fuel efficiency, unmatched towing capability, and the option of Limited edition trim. So what are you waiting for? Come test drive the brand new 2016 F-150 today at Mainland Ford! Talk with our experienced sales team to find out what you want or need for your new F-150. Contact us today at (604) 239-0323 or info@mainlandford.com.